Vanilla Irish Cream is my second review from Otis & Leaf. I’m a bakery girl at heart and this fragrance sounded delicious. A perfect night cap of vanilla irish cream…. That description doesn’t tell me much but that’s okay. I let my imagination take over and it was hoping for lots of Bailey’s Irish Cream on a bed of creamy vanilla, just like my favorite drink… Bailey’s with milk on the rocks. Mmmm!! I can almost taste it. Sniffing the wax before lighting the wick, I smelled a perfect blend of the two so that is a very good sign this candle was going to deliver for me. We shall see!! Because this candle was small and there was vanilla in the mix, in my bathroom it went for maximum scent throw. Once the wick was lit, it took a good 15 minutes before I could really start noticing the aroma and Mmmm! My entire powder room smelled just as I hoped it would… an Irish Cream liquor and you could clearly smell the Irish Cream loud and clear. That really impressed me the most. I’ve burned quite a few Irish Cream fragrances but none smelled as realistic as this one. The vanilla was there as well adding a perfect balance of cream and sweetness. Loved it! Strength – I would rate this candle an 8 out of 10 in a really small room. That’s pretty good. If you want to scent a larger room, I would go for their 16oz size. Vanilla Irish Cream was a hit with me and I’m glad I had the chance to try it. It actually made me want to go run to the store and purchase a bottle to smell and drink. Hey! No judging! Haven’t you had Bailey’s on the rocks with a wee bit of milk? YUM!!! Seriously…. YUM!! A must have cocktail for holiday drinking. 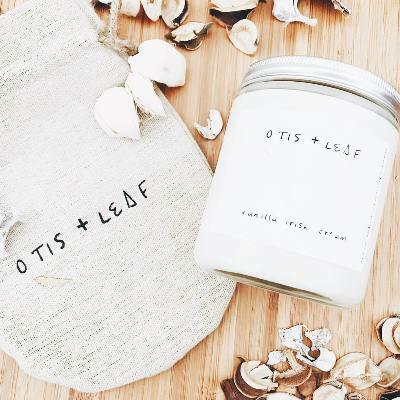 Read my Otis & Leaf review from the beginning.